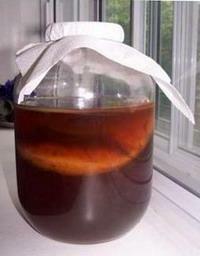 Kombucha is a symbiotic colony of bacteria Acetobacter xylinum and yeast imperfect fungus Candida mycoderma. Has the appearance of a thick gravelly-mucous film dirty-white, smooth the top and wavy-haired one on the bottom. Received a refreshing drink (tea brew) has a pleasant sour taste, slightly Kairouan. At room temperature the optimum composition of the drink is reached after 7-8 days. In the drink saved caffeine and tea catechins, ascorbic, Niacin, Pantothenic acid, thiamin and Riboflavin, non-fermented sugar. In addition, it contains resulting from yeast and bacterial fermentation alcohol, carbon dioxide, acetic and partially gluconic acid. Kombucha is grown in sweetened tea extract (100-150 grams of sugar per 1 liter of infusion). Through 7-8 days after planting colonies in the infusion of tea formed a pleasant sour, slightly carbonated drink. In the drink saved caffeine and tea catechins, ascorbic, Niacin, Pantothenic acid, thiamin and Riboflavin. In addition, in the tea fungus contains alcohol, carbon dioxide, acetic and gluconic acid.